After our changes to E - Vorpal Spikes last patch, Cho’s damage has ended up a bit overtuned. The slow makes it easier for Cho’Gath to land the rest of his damage, so his spikes don’t need to bring quite so much pain on their own. Historically, Dr. Mundo has succeeded as a late-game frontliner against multiple sources of magic damage. Like other tanks, burst mages can’t one-shot Mundo, but while other tanks are left battered after the initial barrage, Mundo’s healing brings him right back up to full. We’re doubling down on his anti-mage identity by making giving him the tools to fight off sustained magic damage as well. 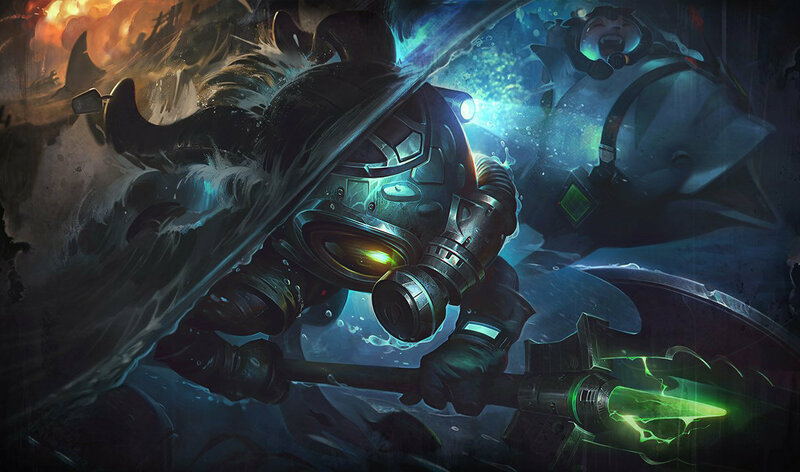 Like Elise, Gragas just clears too quickly for all of the other tools he brings to the table. In addition, Gragas now that the timing on his ultimate has gotten more intuitive, we feel safe bringing up the cooldown. Fixed a bug where Kled's Q - Bear Trap on a Rope ended Kayn’s R - Umbral Trespass early. 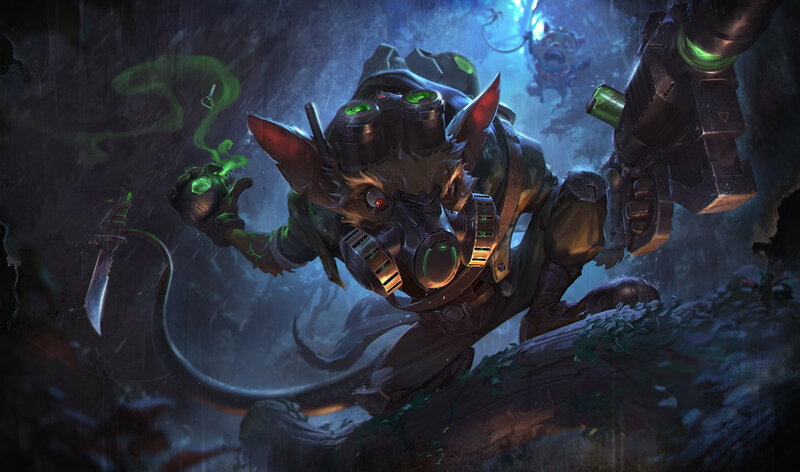 newCLARITY Poison Trail’s opacity has been adjusted for colorblind mode and various skins. Riot Singed’s Poison Trail visuals now properly change color when colorblind mode is activated. newCHUG CHUG CHUG Singed now correctly receives stats instantly, as opposed to sometimes having up to 0.25 seconds delay. HAVE FUN Starting a message with “/me” adds your summoner name to the front of the message and makes it look like a notification rather than a chat message. Use it to talk about yourself in the third person in pre-game lobbies, Clubs chat, and direct conversations. CUSTOMIZATION We’ve added a toggle that adds attack-move commands to left clicks. You can still left click on HUD elements (ex. the item shop), but will issue attack-move commands to the target location beneath the HUD. OVERRIDE While this toggle is active, use SHIFT+Left Click to interact normally with the HUD without attack-moving in the process. 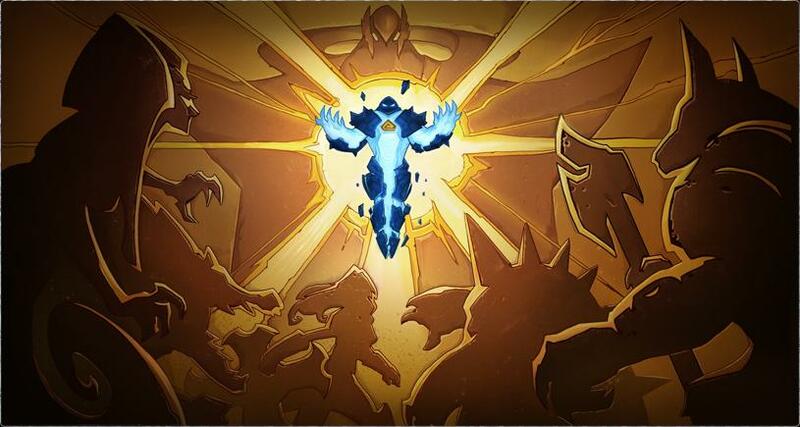 Claim the incredible power of Ascension to conquer the Crystal Scar of Shurima. Ascension is now live from 28/7/17 08:00 BST - 1/8/17 12:00 BST and 4/8/17 08:00 BST - 8/8/17 12:00 BST. Spirit Fire Brand’s Passive - Blaze, E - Conflagration, and R - Pyroclasm no longer have higher volume levels compared to his classic skin. Snow Day Bard’s W - Caretaker’s Shrine no longer has a higher volume level compared to his classic skin. Singed’s corpse no longer triggers his Passive - Noxious Slipstream. Because, you know, he’s dead. Multiple Singed’s in a game no longer reset each other’s cooldown on Passive - Noxious Slipstream. Fixed a bug where - if Kindred used Q - Dance of Arrows to jump over a wall, the cast range of E - Mounting Dread would be permanently increased. 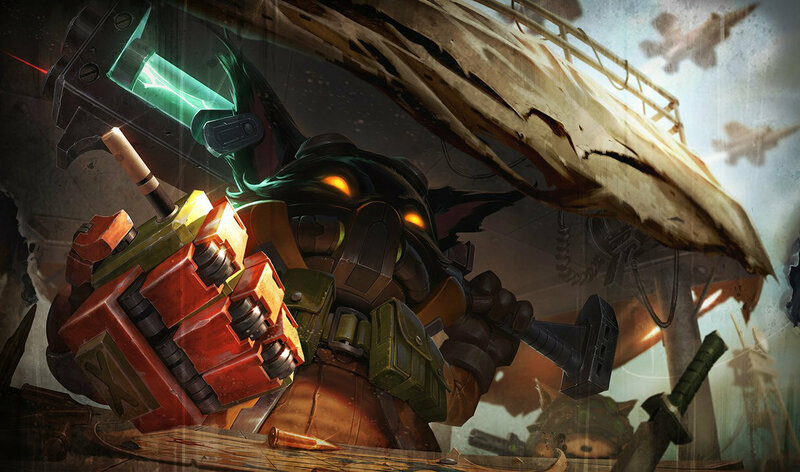 Sweeping a ward no longer plays the sound effects to Heimerdinger’s E - CH-2 Electron Storm Grenade when he is in the game. 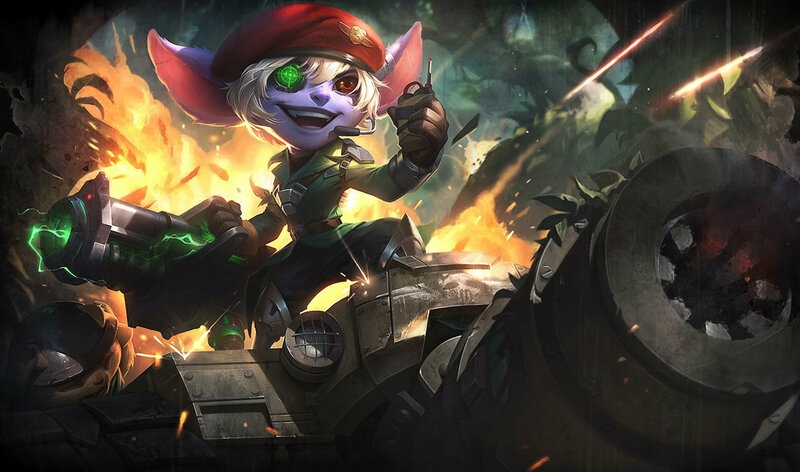 Heimerdinger’s R - Upgraded!!! W - Hextech Micro-Rockets now correctly do reduced damage after the first hit to Baron Nashor. Heimerdinger’s RE - CH-3X Lighting Grenade no longer has the old AP ratio of 60% for the second and third bounces. Fixed a bug where Zac could channel E - Elastic Slingshot while under hard crowd control effects if he used it right before they were applied. Headhunter Caitlyn’s W - Yordle Snap Traps are no longer less clear in brush compared to her other skins. Winter Wonder Karma’s W - Inspire and RE - Defiance have been better differentiated from Winter Wonder Lulu’s E - Help, Pix! have been better differentiated. Slayer Pantheon's R - Grand Skyfall SFX are no longer delayed from enemy perspective. Primetime Draven’s Q - Spinning Axe no longer uses Pool Party Daven’s SFX. Red Riding/Sweetheart Annie’s R - Tibbers now use appropriate fire SFX when spawned. Full Metal Jayce’s W - Hyper Charge custom VFX have been restored. Dawnbringer Riven no longer causes other Rivens in the same game to steal W - Ki Burst SFX. Pulsefire Ezreal’s W - Essence Flux on-hit SFX have been restored. The on-hit SFX volume for Pulsefire Ezreal’s R - Trueshot Barrage has been turned up to be equivalent to all other Ezreal skins. Master Chef Tahm Kench’s no longer clips through his body during several animations. Purple overlay no longer hides Malzahar’s skins when his Passive - Void Shift is active.